Elizabeth and Darcy have recently gotten married and trying to live happily together, but they both long for one thing: a child. 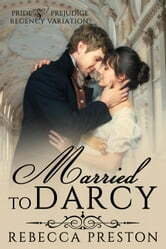 Elizabeth worries that Darcy is not showing interest in her as much due to her struggling to have a child. It doesn’t help matters that Jane, who is happily married to Bingley, seems to have a child almost every year. Lydia and Mr. Wickham are having their third child. Elizabeth fears that she may be the only sister not able to bear children. Darcy has invited his cousin Anne to visit them. Darcy and Anne get on well together, which sparks a fire of jealousy in Elizabeth. Will Elizabeth be able to gain back Darcy’s love? Will she be the only sister who would never have kids? Will Elizabeth find happiness in her marriage again? Arranged To Darcy is a full-length clean and sweet romance novel that tells another Pride and Prejudice retelling between Darcy and Elizabeth.